Before the big day arrives, know the intricacies specific to obtaining a New York State marriage license—so when the time come to finally say “I do,” it’s official by law, too. It’s a fairly straightforward process that can be taken care of easily in an afternoon as long as you’re prepared. Here’s what you need to know about getting hitched in New York. There are two layers of time limits to keep in mind as you plan when to go and apply. A New York State license is valid for 60 days—so you’re wedding date needs to be two months away or sooner—but at least two days from when you go, as there’s a 24-hour waiting period before you can get married. No matter where you’re getting married in New York, the same license applies—so you can go to the most convenient local town or city clerk’s office, even if it’s in a different town (or city) from where you’re getting married. Both of you need to be there to sign the application in front of the clerk at the same time, so plan your trip together. You’ll need to pay a fee—$35 in New York City, $40 everywhere else—at the time of your application. Bring your checkbook just in case, as some clerk’s offices have different payment policies. You don’t need to worry about blood tests or premarital exams, as New York is not one of the states that requires these. To obtain a marriage license, you need to show proof of identity and age (not unlike getting a passport). You must bring two separate documents, one for each. Proof of identity documents include: Driver’s license, passport, employment picture ID or immigration record. Proof of age documents include: Birth certificate, driver’s license (if you also have a passport) or naturalization record. Once you’ve obtained your marriage license, hold onto it (in a safe place!) until the big day—and be sure to bring it with you. It’s common to ask your parents or wedding party to be responsible for it on your wedding day, so it’s one less thing for you to keep track of. 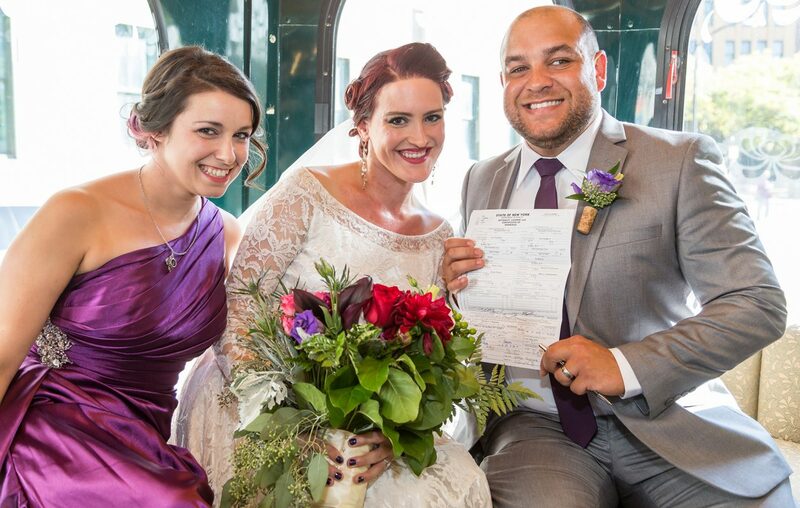 The person who officiates your wedding needs to sign the marriage license following the ceremony in order for it to be validated. Make sure to return the signed marriage license to the town or city clerk who issued it so they can complete the process and make it official. You’ll receive your marriage license in the mail once it’s been validated. For more information, visit health.state.ny.us.